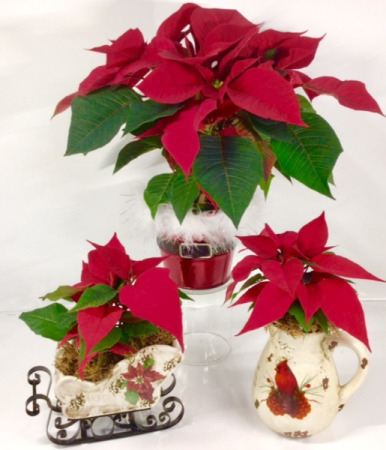 Send a little something special with this bright red poinsettia in a ceramic sleigh, cardinal pitcher or cute metal tin with fuzzy trim. 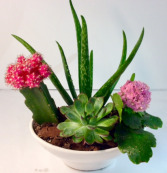 This is a decorative ceramic bowl filled with colorful succulent plants like a "moon" cactus and kalanchoe. This is the perfect gift for a desk just to say "thank you!" and show appreciation. 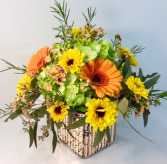 Show your appreciation with this gardeny mixture of flowers in a gold glass mercury cube. 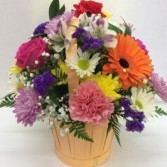 It has a lush green hydrangea, orange gerbera daisies, yellow viking mums and fragrant orange waxflower. Upgrade is in a bigger cube with more of the same flowers.